High tides and gale force winds could bring more flooding to parts of south-west England and the Midlands, the Environment Agency has warned. It has five severe flood warnings – meaning a danger to life – three on the Severn estuary near Gloucester and two on the north Cornwall coast. 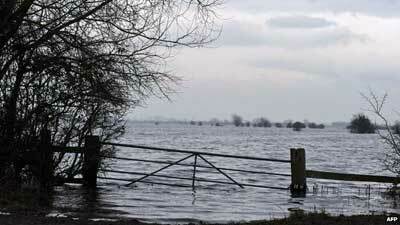 Lesser warnings affect many parts of Britain including western Wales and the flood-hit Somerset Levels. Cobra, the government’s emergency committee, has met on the issue. Discussions on Friday evening were chaired by Environment Secretary Owen Paterson who is urging residents to “listen to all the advice being issued”. “Environment Agency staff are working day and night, alongside the emergency services and other local specialist agencies, to get communities ready for the bad weather,” he said. A band of heavy rain swept across the south west, west Wales and southern England on Friday evening bringing up to 30mm (1.2in) to already-saturated ground. Kate Marks, the Environment Agency’s flood risk manager, said: “A low pressure system combining with high tides brings a risk of coastal flooding to many parts of England. 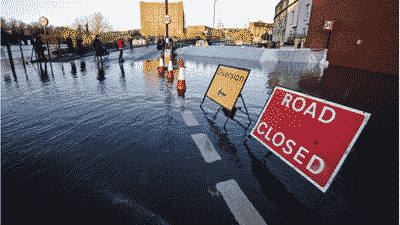 “The risk is highest for south-west England, although many coastal areas will be affected and the public should stay away from coastlines and tidal areas and not drive through flood water. The Environment Agency said gales and waves could combine to cause possible overtopping of flood defences and sea walls, property flooding and travel disruption over the weekend. 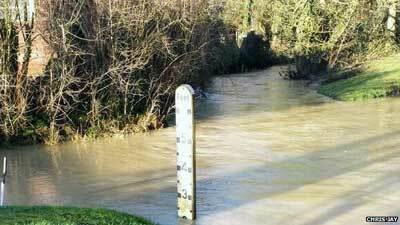 BBC weather presenter Tomasz Schafernaker said gales were heading towards Britain, with the risk of further flooding. He said winds would gust at up to 70mph (112km/h) in west Wales and south-west England. There are also about 160 flood warnings and 290 flood alerts in England and Wales with parts of south-east and north-west England and the Yorkshire and Hull coast all said to be at risk. People in Aberystwyth are not taking any chances this time around after twice being hit by floods and storms in January. Six hundred students have been moved from their seafront accommodation to alternative digs elsewhere on campus. The seafront has been quiet this morning with only the occasional jogger or dog walker braving the promenade. 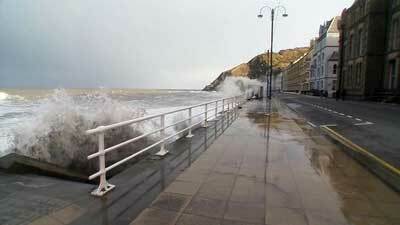 By high tide at 08:41 GMT the waves had begun to crash over the sea wall but no damage has been done so far. 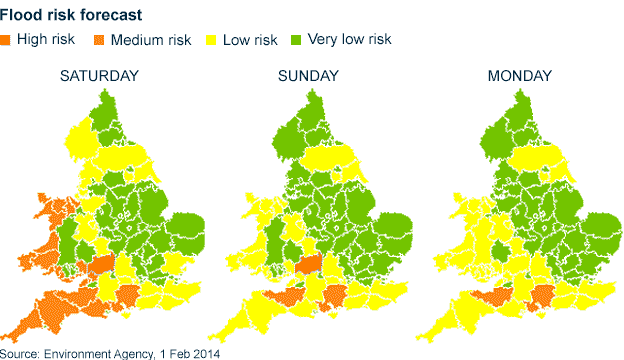 High winds may cause problems later on and further extremely high tides are awaited over the weekend. Some residents have told me they think the precautions were a little over zealous but the authorities were not taking any chances. Communities along the Welsh coast, already hit by a storm in early January, are braced for possible further flooding. Leisure centres in Cardigan and Aberystwyth are open as emergency evacuation support centres if required. The youth centre in Upper Borth is also open. Adam Wood, from North Somerset Council, said teams had been dispatched along the coast. Speaking from Clevedon, where a seafront road has been closed as a precaution, he said: “We have got crews in three of our coastal towns. The BBC’s Katy Watson in Clevedon said there had been a sense relief that the big waves had so far failed to materialise – but the council was taking no risks. Several riverside homes have been flooded at Minsterworth in Gloucestershire where the tidal surge has peaked and the water was receding. In Europe, areas of Italy and France are on flood alert as heavy rain brings chaos. Hundreds of people have been evacuated from homes in Pisa, Italy, while widespread flooding is expected on the French Atlantic coast. Meanwhile, Prime Minister David Cameron has expressed “enormous sympathy” for the people who have been living on the Somerset Levels where 25 sq miles (65 sq km) have been flooded for several weeks. Writing in the Western Daily Press, Mr Cameron said: “I know that a great deal of work has been done to try and alleviate the situation but it is not acceptable for people to have to live like this almost four weeks later – and I am not ruling out any option to get this problem sorted out. The government and the Environment Agency have been criticised by MPs and local councils in Somerset, where the agency said it was now running pumps 24 hours a day to drain the water. Personnel from all three branches of the armed forces are currently on stand-by to help villages cut off by the floods. But the Environment Agency has said dredging of rivers in Somerset would not begin until flood water had drained and river banks were safe. The Met Office has issued its own warnings of heavy rain and high winds of up to 60mph for many southern and western areas. “Winds will increase on Saturday, with gusts widely to 50 to 60 mph, and locally to around 70 mph in exposed parts of the west,” it said. The latest warnings come at the end of a month which has already become the wettest January on record for parts of southern England. 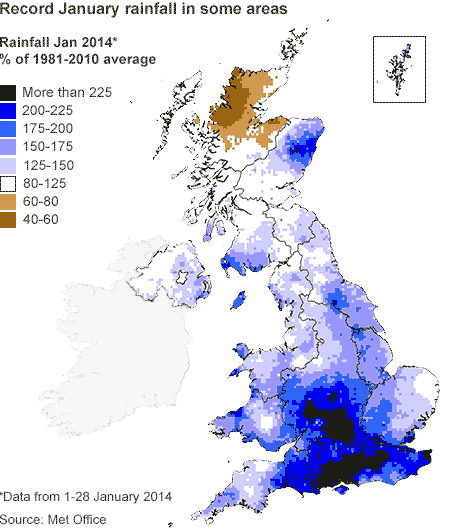 Up to and including 28 January, the south east and central southern England had a record 175.2mm (6.9in) of rainfall in January – beating the previous record of 158.2mm for the same parts of England set in 1988.